I feel like baking,not so much for the eating part[that too,yes] but for the whole exercise of baking-measuring out the ingredients,sifting the flour,beating the batter,lining the tins and waiting for the cake to bake while the whole house is filled with the yummy aroma coming out of the oven..Hell,I miss baking!! So many great recipes are doing the rounds,I've especially bookmarked this cake from Deeba's this one from Baking Bites,The Food Librarian is tempting me with her Bundt Cakes,I will be baking a Bundt Cake for sure on November 15th! !Not to give in to temptations,I've cleared my stock of butter,flour and eggs..ah the miseries of one trying to lose weight!! Why all this banter for a simple soup post? ?Well,this explains the plight of the poor soup.I had some yellowing broccoli in the fridge and it was pureed into a soup.Doesn't sound much exciting,right?But if you are not dieting,there are different ways to pep up this simple soup.I had the same soup once in The Wharf,Mahabalipuram where cubes of Cheddar was added to the soup and every mouthful was so flavorful with the slight aroma of Broccoli and the strong taste of Cheddar..ah,bliss!! In a kadai add a tsp of oil and saute onions. When the onions start browning,mix in the broccoli florets and give a good toss. Add a cup of water and let it cook for 5-7 minutes. Switch off the flame and let it cool down to room temperature. Blend to a puree in the mixer adding milk as required. If it is too thick,you could add more water or milk. Put it back into the kadai and cook it for another 3-5 minutes. Add enough salt and pepper to taste. You could add cubes of Cheddar just before serving the soup for a gourmet touch!! i feel like having this now,.. The soup is gorgeous. Love the texture and the presentation. Kudos! yes,yes,yes Divya!! The process of baking is the best part of the whole thing!! Starting form zeroing on a recipe from the scores of bookmarked recipes. 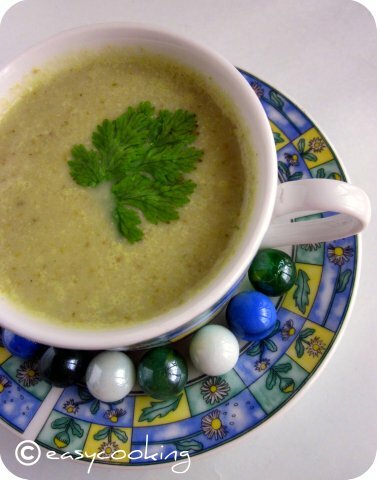 In spite of the broccoli turning yellow, the soup does look inviting. u bet the best way to cheat in a soup to make it taste creamy is to add milk:-)Am sure it tasted great! I always love brocoli siup and this looks delish. It's my first time here. You have a lovely blog and the soup looks delicious!!! Comforting soup! !I have many cookbooks featuring broccoli soup but never got around to doing it..But i would definitely try out your tried n tested recipe!! another good recipe to incorporate broccoli to my diet.. looks great and am sure tasted great as well! 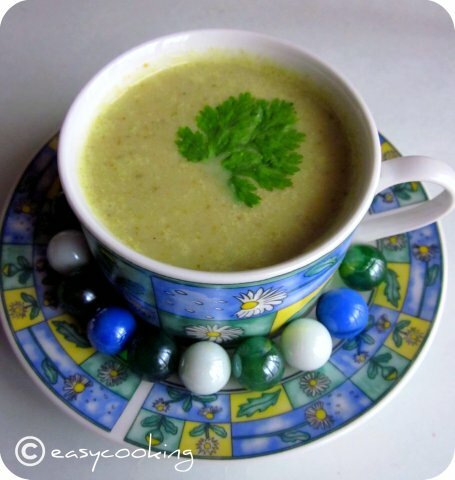 looks thick and creamy..i always like thick soups..they r quite filling :))..nice way to use broccollis. Feel like finishing that whole bowl rite now..my fav soup..
..the wonder with this is that however you do it tastes awesome..with minimum ing and time you have a healthy filling soup!.. if only we got fresh broccolis here!!.. Necessity is the mother of invention is it not? I'm so glad you found a use for your broccoli! Great soup Divya. Sometimes simple is just the best way to go. With winter around the corner here, I'd love to make this soon! I think I'm your newest follower! short list of ingredients and full of taste!